I have seen tags floating around on YouTube for quite some time and always thought they were a great way to learn about new products, bloggers, and to just get to know each other better. 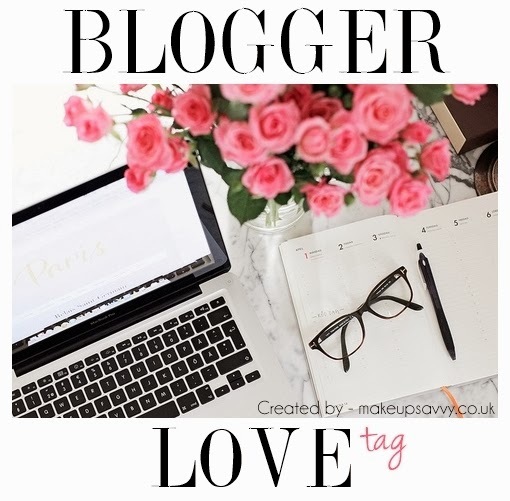 Therefore, when I came across the Blogger Love Tag, started by Fee of Make Up Savvy, I decided to jump right in! Please leave comments bellow letting me know if you like this sort of post and I will try to do more tags in the future. I was late to the blogging game and was introduced to Cupcakes & Cashmere my freshman year in college by a friend. I quickly became engrossed the the blogging world and began to grow my Bloglovin’ feed. I am constantly finding new beauty blogs to read, but my current favorites are Fleur de Force, Essie Button, and Tanya Burr. The most rewarding part of blogging is forming friendships around the world. I have made a lot of great friends through this journey and I look forward to planning trips in the future to finally meet these amazing people in person, but for now, social media/skype will have to do! Essie Button, hands down. We share the same skin tone so everything she recommends is the perfect shade! I read most of my blogs through Bloglovin’. It’s an easy way to get updated on new posts without overflowing your inbox. Alycia Crowley is a huge inspiration. She openly shares life and thoughts on her blog, Crowley Party. With every post, she shares her heart even when she is writing about touchy subject (here). I admire this aspect in a women and I aspire to be more like her. Ivory Lane! I love the clean design and, seeing as blue is my favorite color, the accent color is right up my alley. I know this sounds cheesy, but all of the friendships. I have met so many amazing people through this process, both fellow bloggers and readers. Blogging can be difficult at times (there is a lot of hate floating around) but the positive has always outweighed the negative. Essie Button! Have I mentioned her too much in this post?! But honestly, if you have watched one of her YouTube videos, you can not deny that you would love to read her book. I am sure it would be full of laughs.